Every month the Division of Gaming Enforcement of New Jersey releases the legal online gambling statistics by each licensed operator. So to make it easy for our readers, we have sorted through the reports and compiled each operator’s data below in an easy to read manner. Take a look below to better understand the trajectory of this new industry and which companies are positioning themselves to be market leaders. 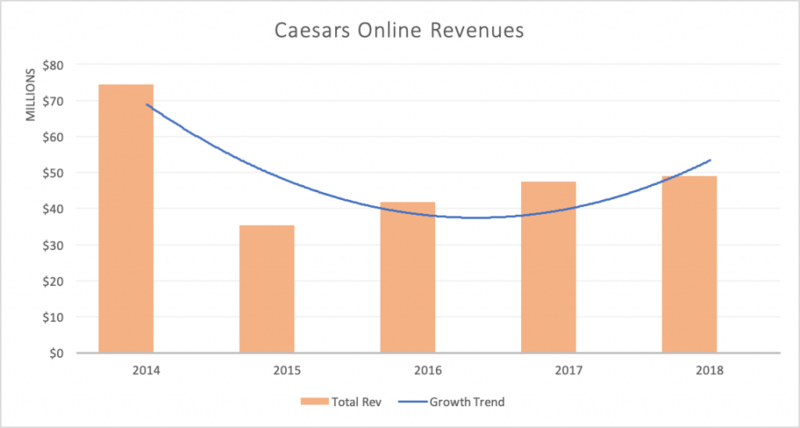 Now that 2018 is over, we can identify new trends between casino operators. As of today, Golden Nugget is the only casino with a positive growth trend every year since the beginning of the industry in December of 2013. What is impressive with Golden Nugget’s performance over the years is not necessarily the total revenue. Instead, it is the margin of victory when compared to other operators in the state of New Jersey. The DGE NJ has reported Golden Nugget Casino’s total revenue for 2018 was $102,784,534. That is a 39.4% increase from the previous year and by far the largest amount of annual revenue to date. 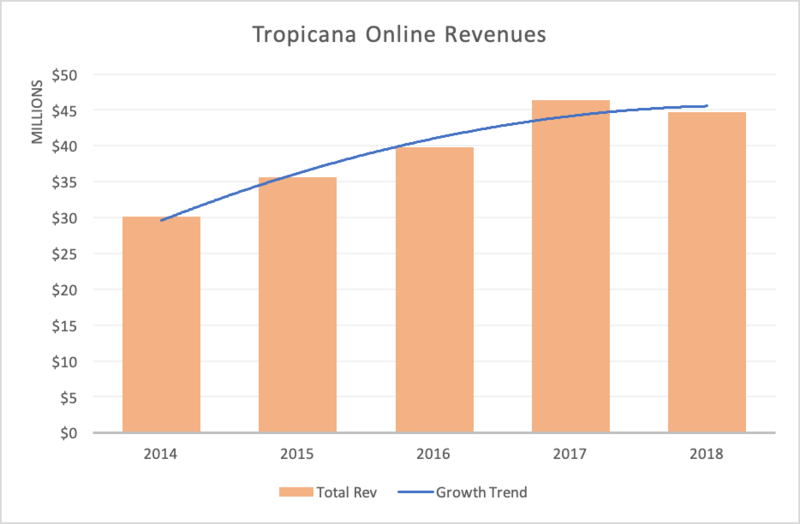 The next closest competitor in 2018 was Borgata Casino at $58,749,803 in total revenue. The casino industry looked a lot different in 2014 then it does now. Most importantly, both the Trump Plaza Associates and Trump Taj Mahal Casino Resort stopped operating by the end of 2014 for externally motivated reasons. 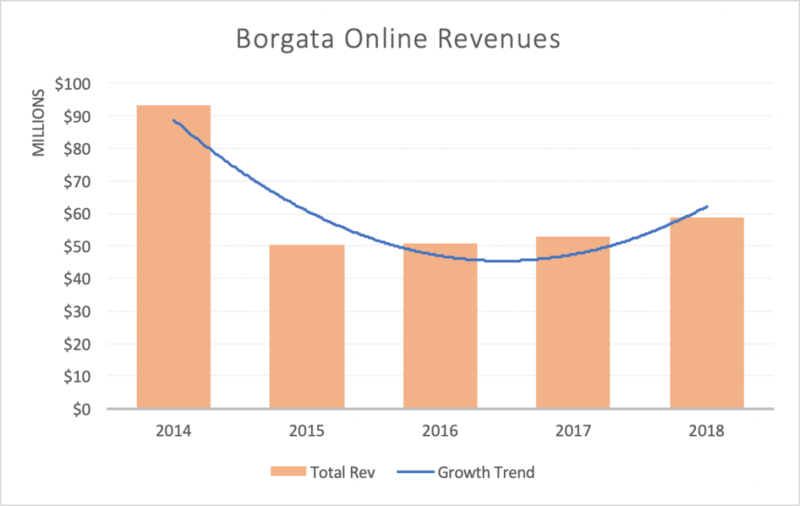 Borgata Casino held the largest market share in 2014 and continued holding that position until 2017. Resorts Casino entered the New Jersey gaming industry in 2015 and currently has 15% of the market share as we finish 2018. 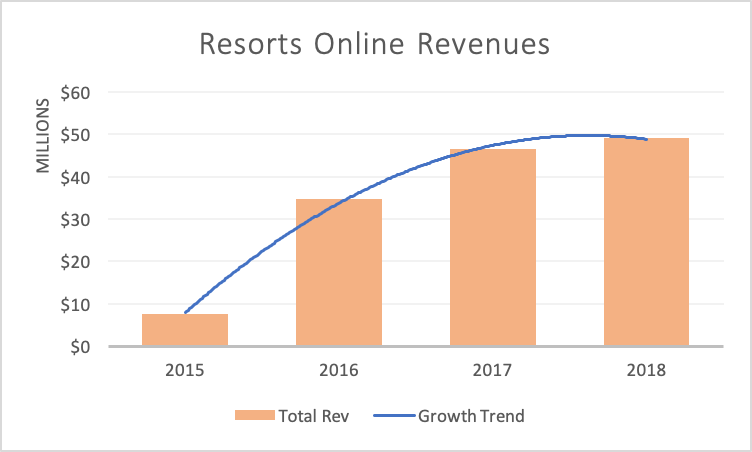 It seems like Resorts Casino is planning to be a strong presence, displaying impressive growth and increasing revenue each year in a more mature and competitive market. Hard Rock AC and Ocean Resort AC entered the space in June of 2018. However, both of them currently only combine for 3% of the total market share. That brings the total number of New Jersey DGE approved online casino operators to 7. 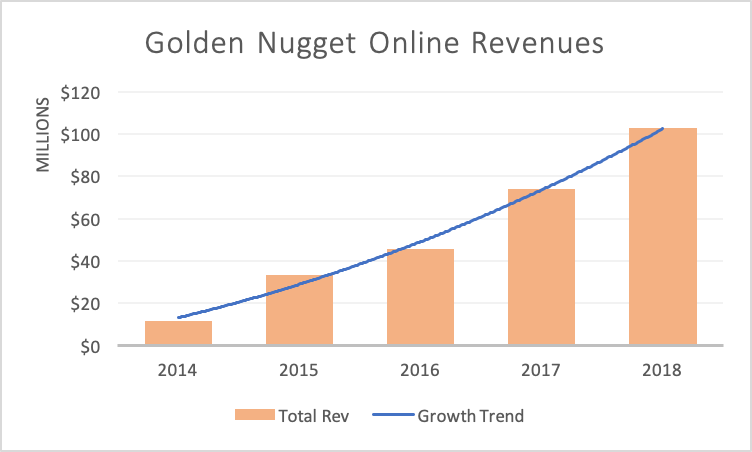 Above all, Golden Nugget has experienced the most impressive growth since launch. In 2014, only 5% of the market share belonged to Golden Nugget. However, by the end of 2018, Golden Nugget owned the largest percentage of the market at 33%. A portion of the operator’s growing success has been attributed to their aggressive promotional offers that solidify customer loyalty. As a result, it will be interesting to track how much more gross gaming revenue Golden Nugget Casino can generate. Analyzing all the internet gambling statistics, you begin to realize just how much interest and participation there is in the industry. The state of New Jersey has benefited immensely from legalizing the practice back in December 2013. To illustrate the growth of the market over time, we can compare the first full month of activity with the most recent month of activity amongst casino operators. In January of 2014, the NJ tax revenue was $1,420,102. The most recent revenue data, December 2018, shows the taxes to total $4,354,895. Comparing those two numbers shows a 306% increase in tax dollars generated in less than 5 years in spite of the industry being in its infancy. These numbers alone should put to rest the concerns over the industry’s viability. How much money does the gambling industry make? In New Jersey, the annual gross gaming revenue generated was $323,332,204 in 2018. That number was up from $266,851,688 in 2017, displaying a 21% year-over-year increase in revenue. How much money is gambled every year? The gross gaming yield from the global gambling market is forecasted to rise to 495 billion U.S. dollars in 2019. That figure is up from 480 billion U.S. dollars in 2018. Which country gambles the most? Online gambling stats show Great Britain currently gambles the most amongst all other countries with 65% of all adults have participated in the industry. Additionally, Great Britain also has the largest amount of gamblers under the age of 21 years old due to the popularity of sports betting, horse racing, and lotteries among parents. Yet, the United States is expected to easily become the biggest online gambling market once the industry is fully legalized. In what countries is gambling illegal? Countries, where gambling is completely illegal, include the United Arab Emirates, Brunei, Cambodia, North Korea, Japan, Singapore, Cyprus, Qatar, Lebanon, and Poland to name a few. Which casino game is most profitable? Although it does not have as high of a winning percentage as other table games, BlackJack is still the most profitable table game for casinos due to the sheer volume of wagers placed. What games do casinos make the most money on? Online gambling statistics show the ‘Big Six’ table game had the highest win percentage for casinos in 2017 with 39%. Yet casinos made the most money in 2017 through ‘BlackJack’ by the sheer volume of wagers placed.